undesirable no. 1? harry potter or a great dane? What would life be without a little subjectivity? If Harry Potter is Undesirable No. 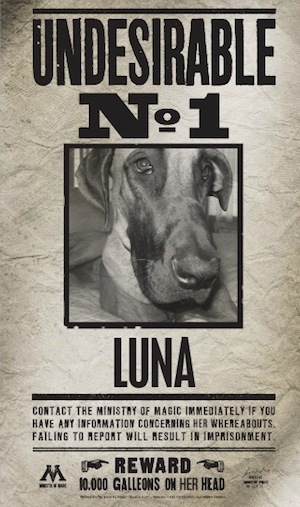 1 in the wizarding world of JK Rowling’s imagination, our Great Dane puppy Luna is Undesirable No. 1 in our world. Not by choice, of course. Rather, it is due to the officious know-it-alls at the American Kennel Club (AKC) who created the imperious AKC Great Dane breed standard. I’ll refer henceforth to the AKC in this commentary as the Pedantics Who Shall Not Be Named (PWSNN). Luna is proudly dirty-chested. She’s as dirty chested as a Welsh coal miner. She also sports a white diamond stamped like a Medal of Honor in the middle of those dark hairs. That’s two strikes against her as far as the breed standard is concerned. In fact, the colorings are as noticeable as Harry’s lightening bolt forehead scar. She meets all of the other color requirements. She also meets most of the other size and body shape thresholds. Beauty and other subjective matters in life are not fixed or subject to binary determination. Remember that “…in the eye of the beholder” wisdom you probably heard multiple times from your parents – even if it wasn’t about you? 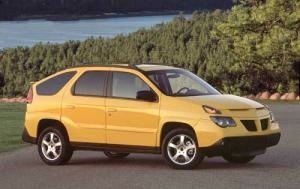 It could have been about the Pontiac Aztek or a Subaru Baja that you thought was beautiful and turned out to be hideous. 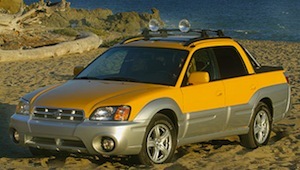 (Ed Note: these vehicles truly are hideous. Truly! ).